When the dial of the pocket watch is removed, a daunting sight is revealed – the combined chronograph and rattrapante mechanism. The chronograph works (A) is contained on the left side of the dial (from about 7 o’clock to 12), and the rattrapante works is contained on the right (from about 1 o’clock to 3 o’clock). Also revealed is the only component on this side of the bottom plate related to the basic movement – the balance cap jewel and its shock protection (C). Note that the shock protection on this side is even more reminiscent of the original design by Breguet. To help navigate around the chronograph works, I’ve colorized the components according to their function (apologies to Ted Turner), and I’ve tried to keep all photos oriented the same direction – top is toward the crown. The components in light blue are related to changing the operating mode of the chronograph: starting, stopping, and resetting. These include the pusher lever (A), its simple wire return spring (A1), and the column wheel detent spring (B). 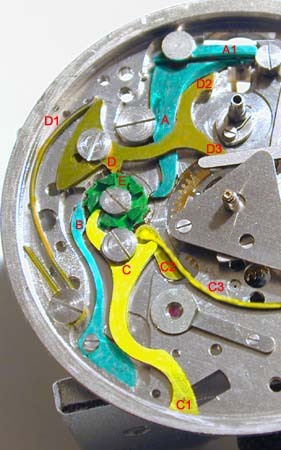 The components marked in yellow are related to the starting and stopping of the movement and hands. These include the start/stop lever (C), which has the balance wheel brake at the far end (C1), and also activates the fourth wheel brake (C2). The return spring for these parts (C3), which continues off the right side of the scan, is an elegantly shaped fabricated flat spring (see the top photo to view the whole part). Finally, the column wheel itself (E) is colored in green. Note that the column wheel is constructed on two levels – the upper level which carries five “teeth” or “columns”, and a lower level which has triangular teeth. 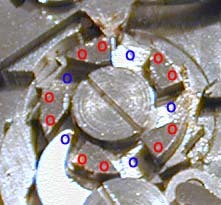 The column wheel and the mode changing devices are shown at left, using the same labeling scheme as the colorized scan. The mode changing pusher (A) and the detent spring (B) both operate on the lower level of the column wheel. As the button on the crown is pressed, the pusher lever (A) is moved downwards in the direction of the arrow. The tip of the lever engages one of the triangular teeth, and causes the column wheel (E) to rotate clockwise. The tip of the detent spring is shaped to engage the same triangular teeth – and ensures that the column wheel stops at one of 15 positions – or every 24 degrees of rotation. When pressure on the crown button is released, the return spring moves the pusher lever back to its starting location, and the tip of the lever slides over the triangular teeth as a ratchet. It should be noted that for a column wheel mechanism, every push on the start/stop button is exactly the same – it moves the column wheel forward one detent. Releasing the button resets the mechanism to do the same thing all over again. The actual changes in the operating mode are set by the “program” on the upper level of the column wheel. Thus, the start/stop and reset mechanisms are insulated from the forces on the pusher - improving reliability and making wear independent of the hardness of the push. This closeup of the column wheel shows the 15 possible “detents” available on the upper level of the column wheel. The red “o“s represent a detent where the start/stop lever or reset lever are pushed to the outside, while the blue “o“s represent a detent where the levers are allowed to “fall” between the teeth. In this photo, the start/stop lever has fallen between two teeth, while the reset lever has been pushed to the outside. It should be noted that the column wheels for single-button chronographs are different from two-button chronos with separate start/stop and reset buttons. For a single-button chrono, the column wheel has three possible orientations at any time: start, stop, and reset. For a two-button chrono, there are only two possible positions: start position and a combined stop/reset position. 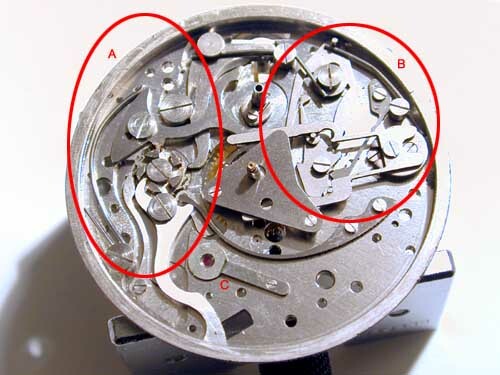 After finishing this section, I encourage you to look at Walt Odets’ article which describes the operation of the Zenith El-Primero – a two button chronograph – if you want clarification of the differences involved. When the start/stop lever has fallen between two teeth, the lever itself rotates clockwise, which releases the balance and fourth wheel brakes. The chronograph is running. 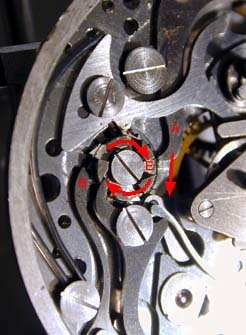 When the start/stop lever is pushed outside after another press of the chrono button, the lever is rotated counter-clockwise, which engages the two brakes again, and keeps the chronograph hands stationary via the friction fit of their pinions onto the movement wheels. Similarly, when the reset lever is pushed to the outside, the reset lever horns are moved counterclockwise out of the way of the heart-shaped cams carrying the second and minute hands. When the lever is allowed to fall between two teeth, the two horns move back, and force the cam to rotate in the closer direction back to the zero point. The following animation shows the chronograph works stepping endlessly through its start-stop-reset cycle. It makes it much easier to understand how the different parts of the chronograph works operate, as well as showing how their operations are coordinated by the column wheel. If you lose track of what you’re looking at, refer to the colored photo at the top of the page – the movement is oriented the same in both photos. This is the end of Part II. Click Here to go back to Part I.